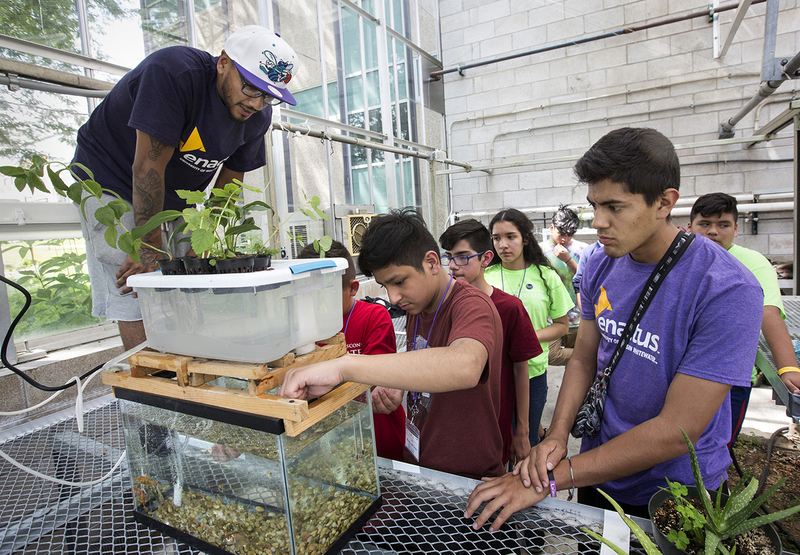 Michael Lozano, left, and Abraham Alvarez, right, teach seventh graders from Escuela Vieau School how to grow food using hydroponics at the Upham Hall greenhouse. Despite the age difference, Abraham Alvarez feels a close bond with the students he mentors. A University of Wisconsin-Whitewater junior, Alvarez is studying integrated science and business. The seventh graders in the classroom with him are 12 and 13 years old. They all hail from the same neighborhood on the south side of Milwaukee — where they attend Escuela Vieau School — and they remind Alvarez of himself at that age. “I just remember being in middle school and not having anybody come talk to us about college or give us any mentorship or advice. It was pretty much all on our own,” he said. 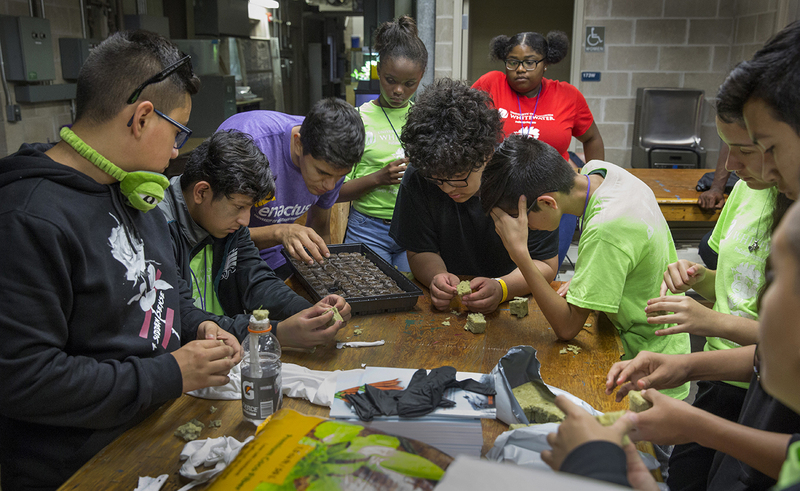 Abraham Alvarez, third from left, works with junior high school students to assemble a bottle hydroponics project. Alvarez is working to change that. He is a member of the student organization Enactus, whose mission is to create a better world while developing the next generation of entrepreneurial leaders and social innovators. He and fellow student Michael Lozano are leading the seventh graders in workshops with hands-on exploration. They are immersing themselves in mechanical engineering by constructing miniature bridges, machines and other apparatus. 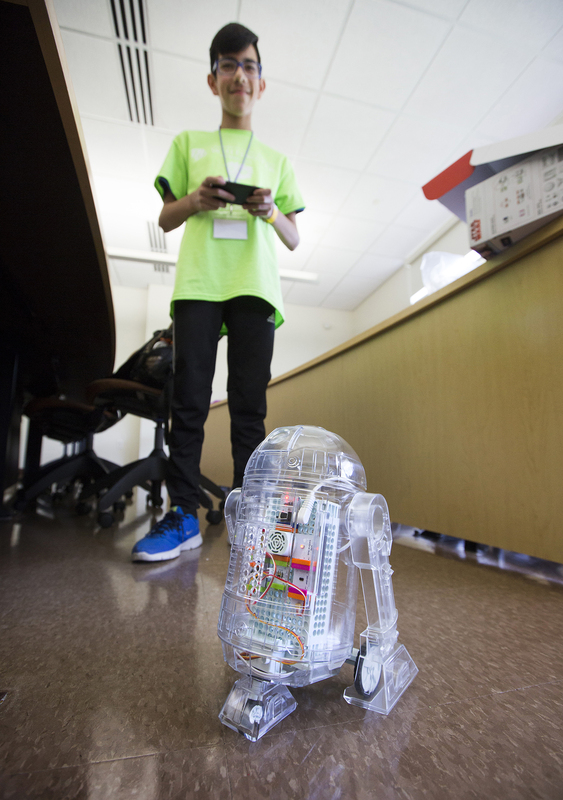 They are exploring robotics by building replicas of droids and from the science fiction saga Star Wars. 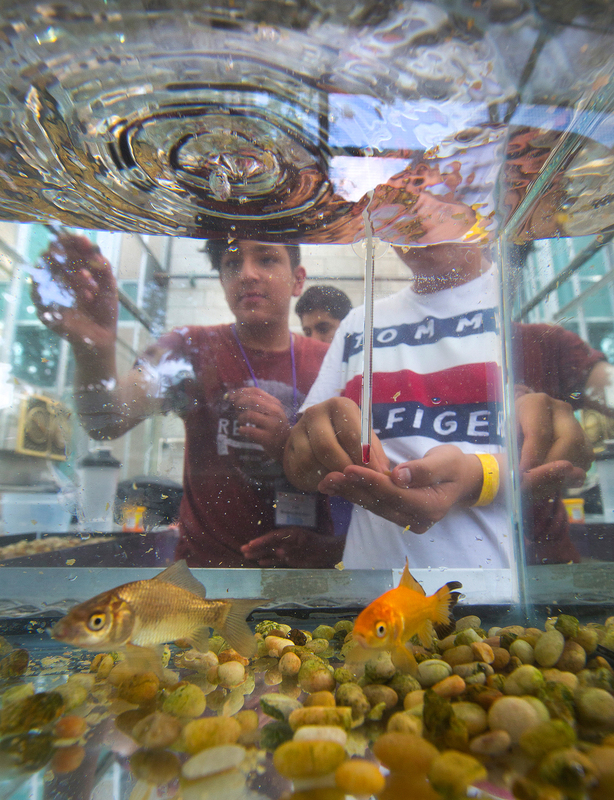 They are diving into hydroponics, watching the symbiotic relationship of fish and fertilizer and water-grown crops. And they are carefully harvesting rosy red raspberries and tasting the sweetness of urban gardening. 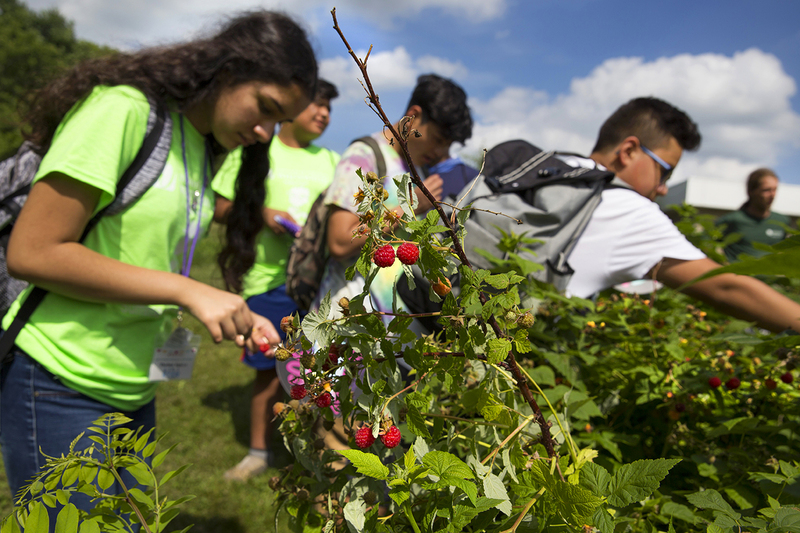 These workshops are possible because of students like Alvarez and Lozano, organizations like Enactus, and initiatives like the STEM Training for Early Engagement and Readiness program, which shared grant money to make the workshops a reality. PreCollege Programs and the office of Student Diversity, Engagement and Success led the efforts. 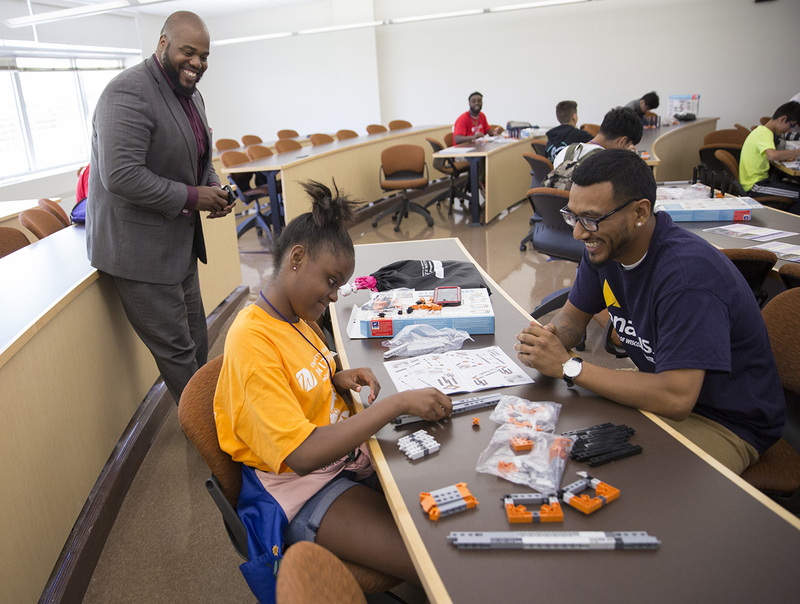 This collaboration aims to bolster and broaden participation in science, technology, engineering and mathematics fields by underrepresented students. People are already taking notice — the program is winner of the 2018 Ann Lydecker Educational Diversity Award from the Wisconsin State Council on Affirmative Action. Members of the Warhawk family will accept the award on Oct. 25 at the state capitol in Madison. Day camper Savannah Patterson, center, shares a laugh as she works out an engineering problem with instructor Michael Lozano, right. LaVar Charleston, assistant vice chancellor for student diversity, engagement and success, joins in the fun. More than just a mentor, Lozano — an international business major — proudly thinks of himself as a “curiosity curator,” inspiring students’ interest in STEM subjects. 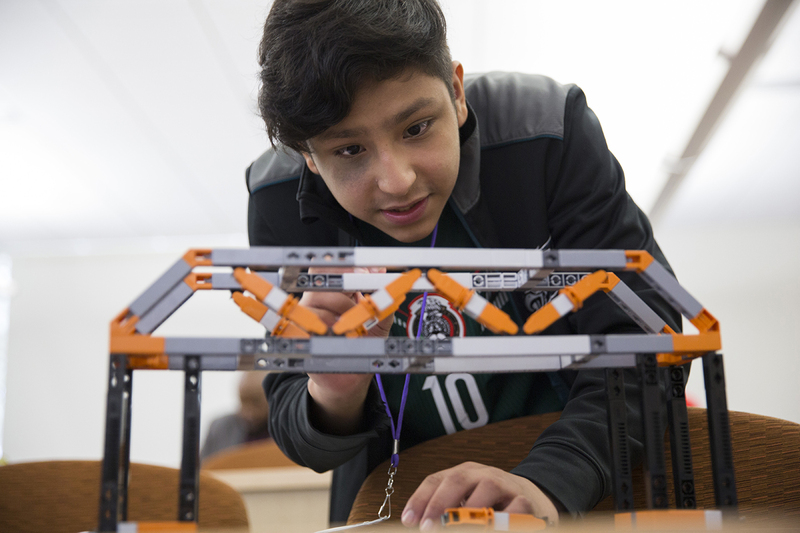 The middle schoolers are not only exposed to other STEM students and professionals who look like them, but they begin to see themselves as being contributing members to the field. And, Alvarez hopes, they have planted a seed in them to pursue higher education.